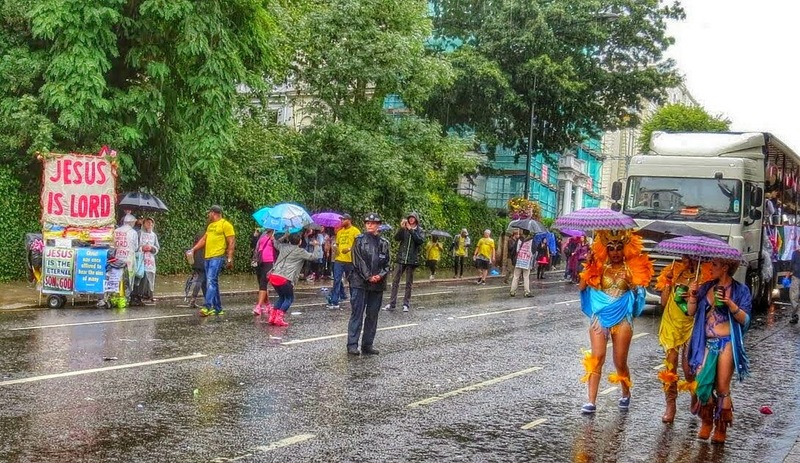 I'll admit, I had my reservations about going to London's Notting Hill Carnival. (a) It was lashing rain outside and (b) a bunch of lads had just boarded the Tube shouting 'Carnival!' before taking a hit of nitrous from a whipped cream container. 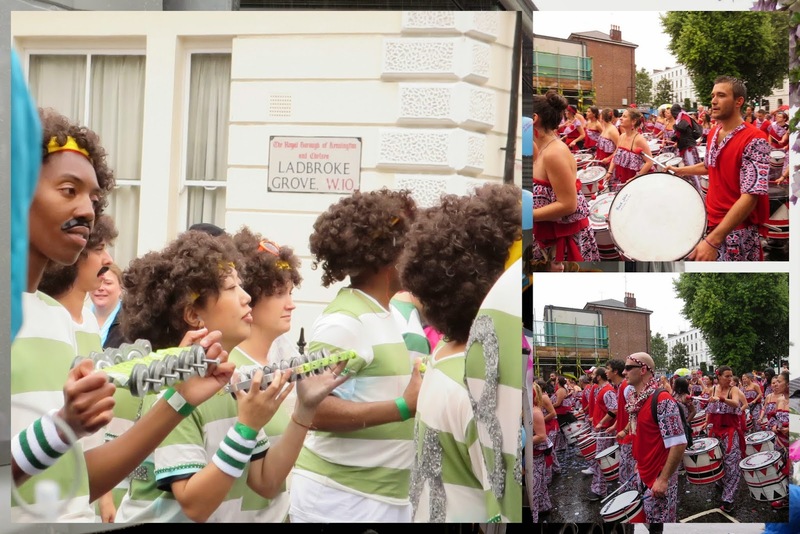 Notting Hill Carnival has noble origins and was started to bring the different cultures living in the neighborhood together in understanding and celebration. Today, it has devolved to some degree into a massive, messy thing. Many of the locals that live on the parade route make sure they are away that weekend and don't come back until Tuesday when the cleaning crews have arrived. Still, every experience is worth having at least once so we made our way over to Notting Hill despite the rain and my reservations to check things out. I Pity The Fool That Don't Eat Jerk Chicken! One of the attractive things about this festival for us was the opportunity to eat authentic and spicy Caribbean cuisine. 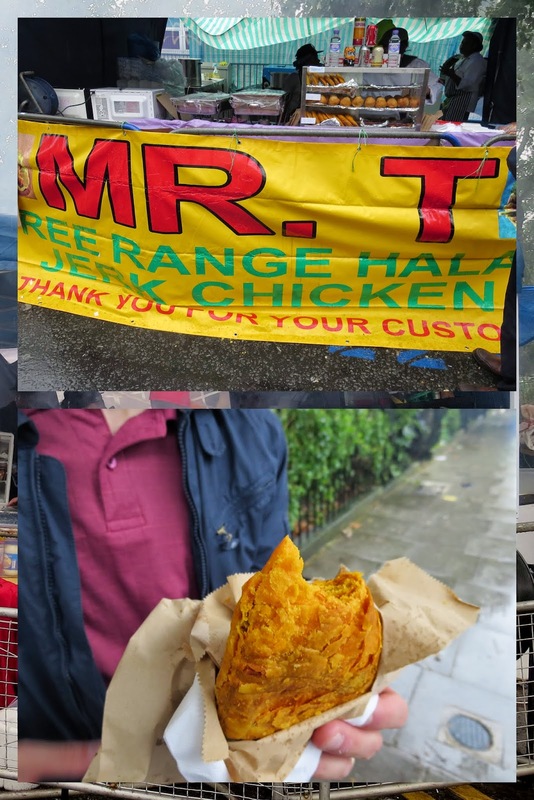 We sampled a hot and flaky Jamaican chicken patty with plantains from Mr. T.
It wasn't clear at all to us how the parade worked at first. We asked a Bobby (policeman) along the route and he basically said that the parade goes round and round a circuit of Notting Hill all day. We finally heard a tinkle of music and made our way towards it. Various community bands featured prominently and spirits were high despite the rain. A number of lorries drove steel drum bands around the parade route adding to the festive atmosphere. Great street art seems to be a hallmark of slightly edgier places and this area of Notting Hill was no exception. 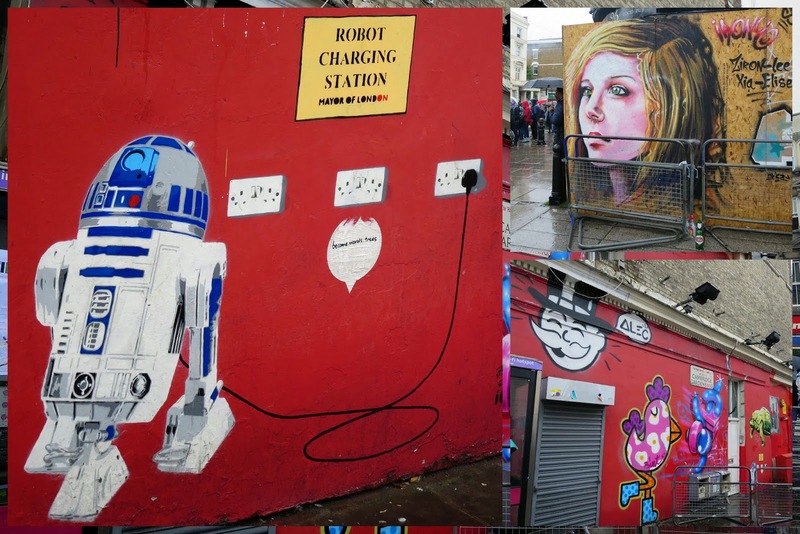 I particularly loved the Robot Charging Station featuring R2 D2. In the parade, people in varying degrees of dress (undress?) danced their hearts out to lively Latin beats. It was fun to watch the smiles on people's faces and the joys of movement despite the inclement weather. Everywhere we looked, authentic Jamaican beer was on offer. It seemed a large proportion of folks were walking around with a Red Stripe in hand. 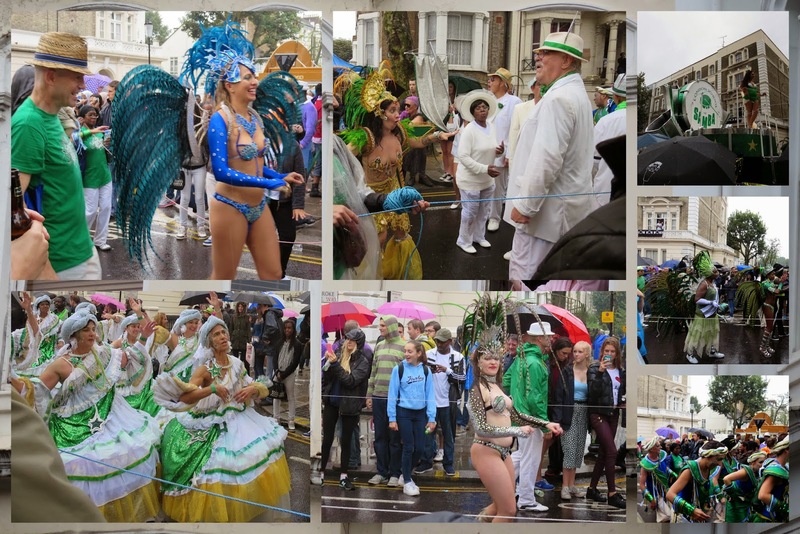 It did indeed rain on our parade but we still appreciated the opportunity to see what Notting Hill Carnival is all about (check out the video clip below). If you'd not into the drinking and drug scene, it's recommended to go early (as we did) before things get messy and out of hand. We hung out for a couple hours, had something to eat and then headed indoors for a drier, more civilized afternoon at the National Portrait Gallery.